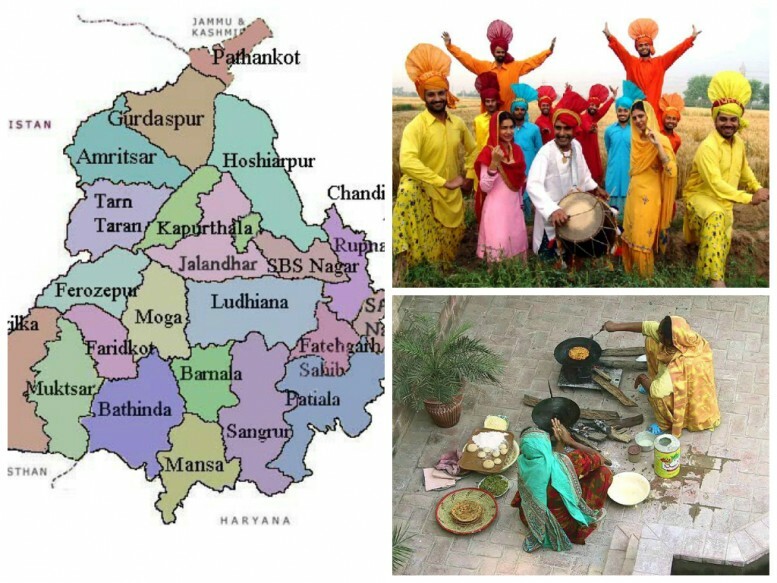 Punjab is one of the states of India, which was formed on November 1, 1966, when most of its Hindi-Spoken areas were divided to form the Haryana as a new state. Punjab is located in the northwestern part of the subcontinent. It shares its border with states of Jammu and Kashmir to the north, Himachal Pradesh to the northeast and Haryana to the south and southeast. The capital of the Punjab is Chandigarh which is also the capital city of neighboring state Haryana. As per the geographical area and location, Punjab has a gross area of 50,362 square kilometers, and if we compare it with the total geographical area of the country its comes out to be 1.54% and is located between 29″30’N to 32″32’N latitude and 73″55’E to 76″50’E longitude. It is the land of fertile soils and abundant waters and it’s certainly a primarily agricultural state. As a civilization, it is one of the most ancient in the world with a distinguished culture. The official language of the Punjab state is Punjabi which is lot similar to Hindi and as per ranking is concerned it is the eleventh most popular language in the world. It has its foundation in the eleventh century and is the successor of Sauraseni Prakrit, that’s known to be an ancient language that has an Indo-European origin. As per the climate of the Punjab is concerned, its continental, being semiarid to sub humid. Punjab’s climate comprises of three seasons. They are the summer months has a period from mid April to the end of June. And then the rainy season in Punjab that’s starts from the months of early July and lasts till end of September. The winter season in Punjab is starts during the months of early December and lasts till the end of February. Sometimes the temperature in summer is very high. In June, also the warmest month, daily temperatures in Ludhiana ( city in Punjab) usually reach about 100 °F (upper 30s C).. Most of the annual rainfall occurs in a period from July to September, also known as the months of the southwest monsoon. The culture in Punjab is very rich and different. The biggest population of Punjab comprises of Sikh. The people of Punjab are well-known for warmth, hospitality and good gesture. If you visit into any village in the Punjab then you will be welcomed with food, glasses full of milk and lassi (cool yoghurt drink) .The system of joint-families is still prevailing in the state of Punjab. There are 22 cities and 157 towns in Punjab. The Major cities of Punjab include Mohali, Ludhiana, Amritsar, Patiala and Jalandhar. The capital city Chandigarh, the dream city of India’s first Prime Minister was planned by the famous French architect Le Corbusier. Appealingly located at the foothills of Shivaliks, it is known as one of the best innovations in urban planning and modern architecture in the twentieth century in India.